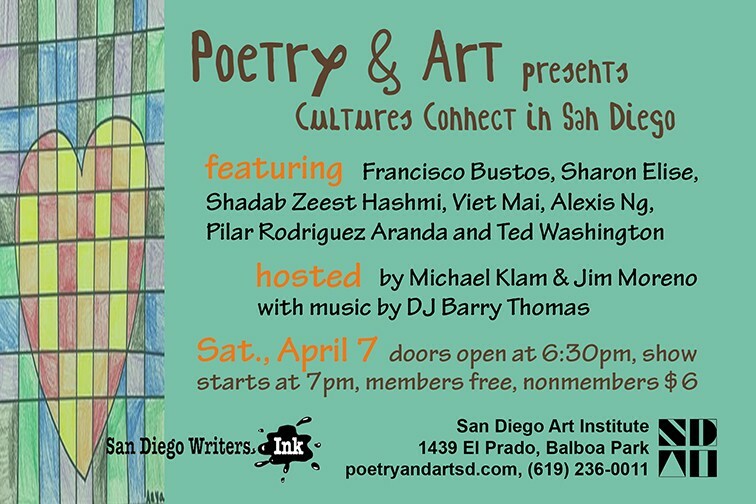 Poetry & Art Series 2018 presents Cultures Connect in San Diego, featuring authors Pilar Rodriguez Aranda, Shadab Zeest Hashmi, Sharon Elise, Ted Washington, Francisco Bustos, Viet Mai, and Alexis Ng. 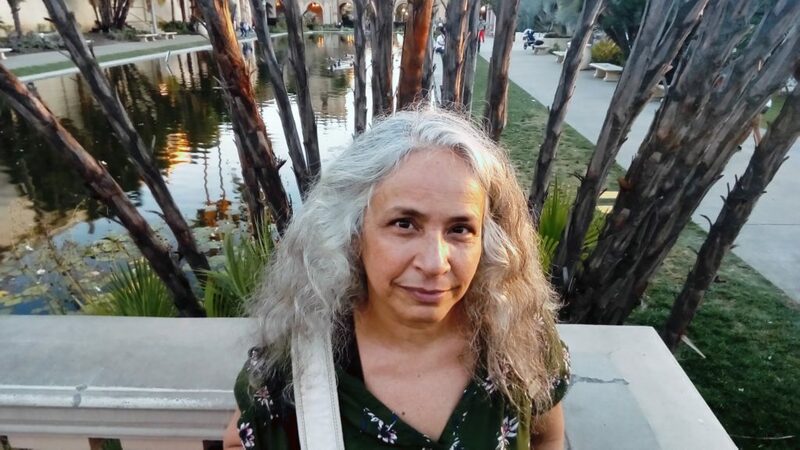 On Saturday, April 7, San Diego Writer’s, Ink and Poetry & Art Series 2018 present Cultures Connect in San Diego, featuring authors Sharon Elise, Pilar R. Aranda, Shadap Zeest Hashmi, Ted Washington, Francisco Bustos, Viet Mai and Alexis Ng. Hosted by Jim Moreno and Michael Klam. DJ Barry Thomas will provide music and sound throughout the show. 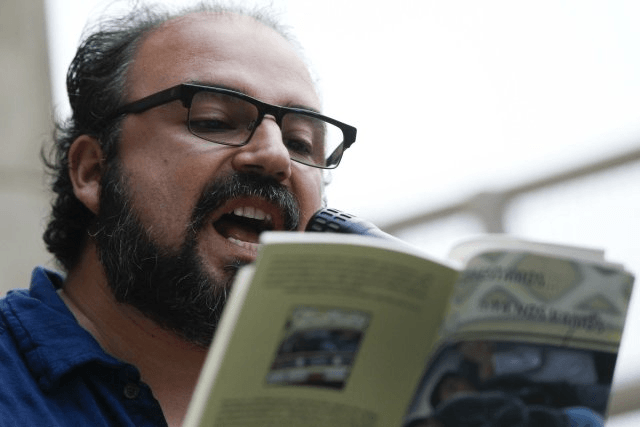 Shadab Zeest Hashmi (born 8/16/1972) is a Pakistani-American poet. She received her MFA from Warren Wilson College. Her poetry has appeared in Prairie Schooner, Poetry International, Vallum, Atlanta Review, Nimrod, The Bitter Oleander, Journal of Postcolonial Writings, The Cortland Review, The Adirondack Review, New Millennium Writings, Universe: A United Nations of Poets, Drunken Boat, Split this Rock, Hubbub and many others. Her essays on eastern poetic forms such as the Ghazal and Qasida have been published in the Journal of Contemporary World Literature, and her essays have appeared in the Washington Post, Pakistaniaat: A Journal of Pakistan Studies and Knot magazine. In 2010, Poetic Matrix Press published Hashmi’s book Baker of Tarifa, which won the 2011 San Diego Book Award for poetry. Eleanor Wilner called Hashmi’s poems “luminous.” Shadab’s latest book is Kohl & Chalk. 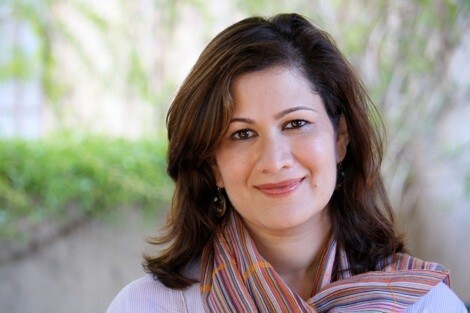 Many of Ms. Hashmi’s poems explore feminism, history and perspectives on Islam. Pilar Rodríguez Aranda, Mexico City, 1961 is a writer, award-winning video artist, and translator. She has published her creative writing and translations in dozens of magazines and anthologies in the American and European continents, and has been translated into English, Arabic, Greek, Italian, Portuguese and German. She recently published a new poetry collection, in a bilingual format, “Una familia más,” “One More Family,” available online. 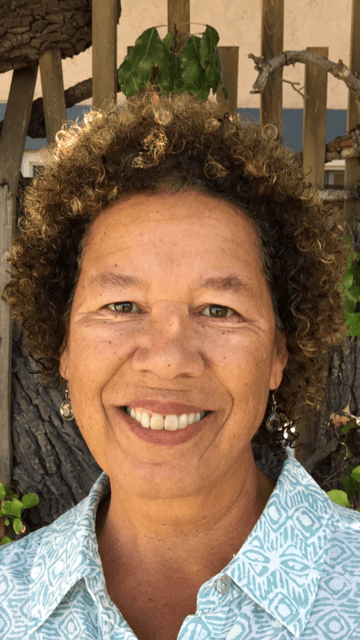 Sharon Elise, Professor and Department Chair of Sociology at California State University, San Marcos conducts research and teaches on critical race and gender issues. 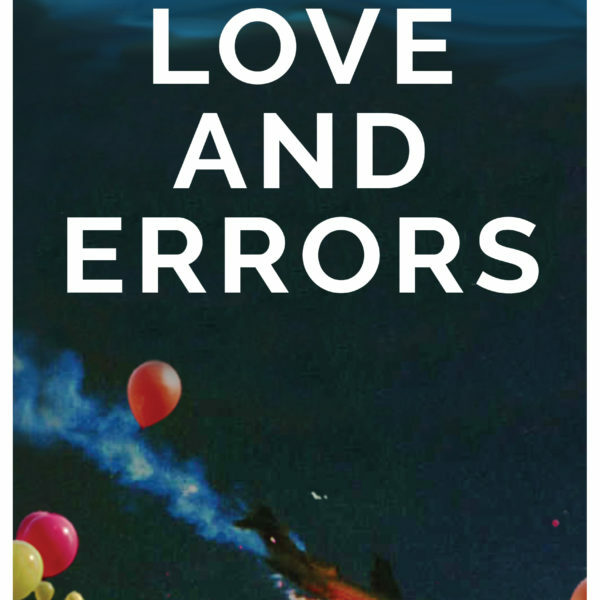 She brings her sociological insight to poetry and poetics to sociology. 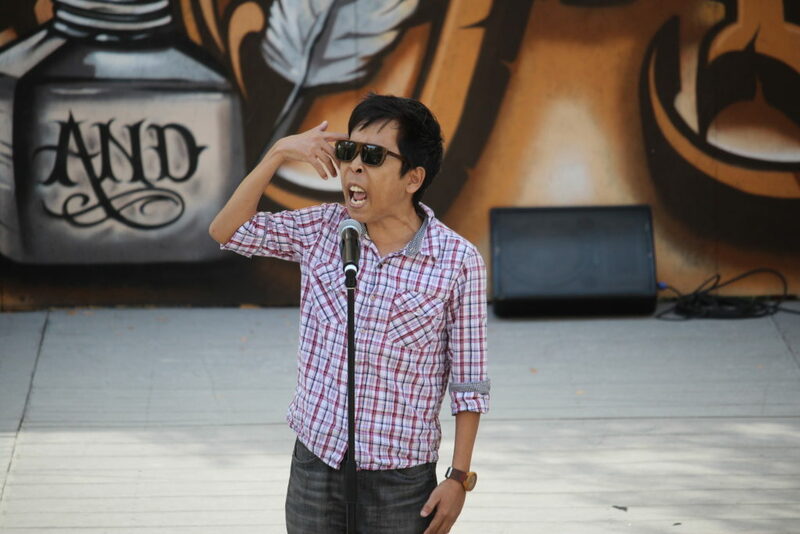 Viet Mai is an educator and performance poet. He was born in San Diego and graduated with a math degree from UCSD. Last year he earned a spot on the San Diego Slam Team, and the group won the 2017 National Poetry Slam. In 2015, he received a Special Commendation by the City of San Diego Race and Human Relations Commission. Ted Washington is an artist, author, poet and reluctant businessman. He now lives in San Diego, after spending time as an apprentice draftsman for a beer brewery in St. Louis, an Internal Revenue Service employee in Springfield, MO, a retail sales representative in Denver, CO, and temporarily homeless vagabond turned baker on the beaches of Venice, CA. 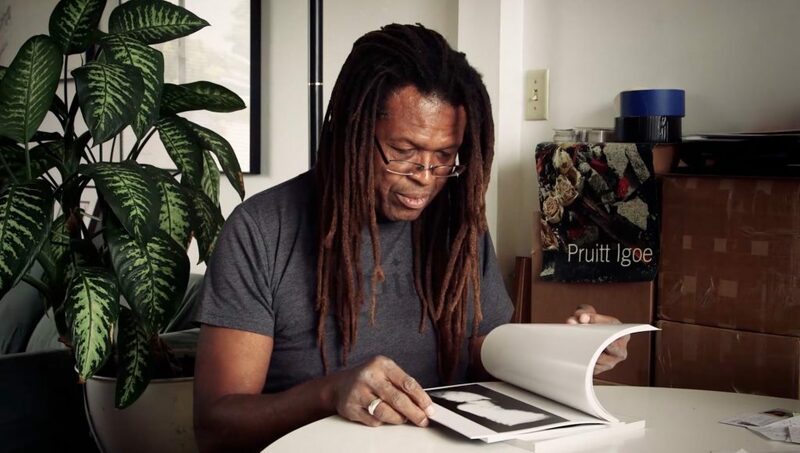 Ted is the founder of Puna Press and the performance group Pruitt Igoe. Pruitt Igoe was awarded a Synergy Foundation grant and performed in Harlem, New York City. Ted Washington won the BRAND 37 purchase award, with the Glendale Library acquiring one of his artworks for their permanent collection. Francisco Bustos lives in San Diego, is professor of English Composition at Southwestern Community College (Chula Vista, CA,) where he is a coordinator for the literary series “SWC Guest Writer Series.” Forms part of the poetry/music group Frontera Drum Fusion where he plays guitar, bass, indigenous percussions, digital music and performs bilingual poetry in English and Spanish, with some Spanglish, and Ingleñol. Alexis Ng is Alexis Ng is 14 years old and is an 8th grade student at Santa Fe Christian Schools. Alexis previously played the cello and the piano, placing as a Winner in the 2011 Southern California Junior Bach Festival and 2011 MTAC San Diego Sonata Competition. She had previously been invited to perform and has performed at various functions, including the 2011 Pan Asian Lawyers of San Diego Benefit Gala, 2011 Annual Awards Gala of the Columbia University Alumni Club (San Diego branch), and 2012 Target Free Second Sunday Concert at the Orange County Museum of Art. Currently, she is on a debate team, but her passion is poetry. She has had one poem published in a poetry compilation and another short opinion piece published in the LA Times. Jimmy Jazz Features at Palabra!